The current environment I am working for had an issue with Enterprise Vault not archiving a users mailbox, this user had left about 3 months prior. Users can’t be disabled or expired in AD, they also cant be hidden in the GAL for archiving to work. 19/11/2015 02:23:21.013: Log file created (level 1). 19/11/2015 02:23:21.014: User has never been enabled. 19/11/2015 02:23:24.955: FUI: Not loading UI as action map is empty. Is the user enabled? 19/11/2015 02:29:21.093: User has never been enabled. 19/11/2015 02:29:21.094: FUI: Not loading UI as action map is empty. Is the user enabled? The user of course wasn’t enabled for archiving. On the Tools menu, click Enable Mailboxes. 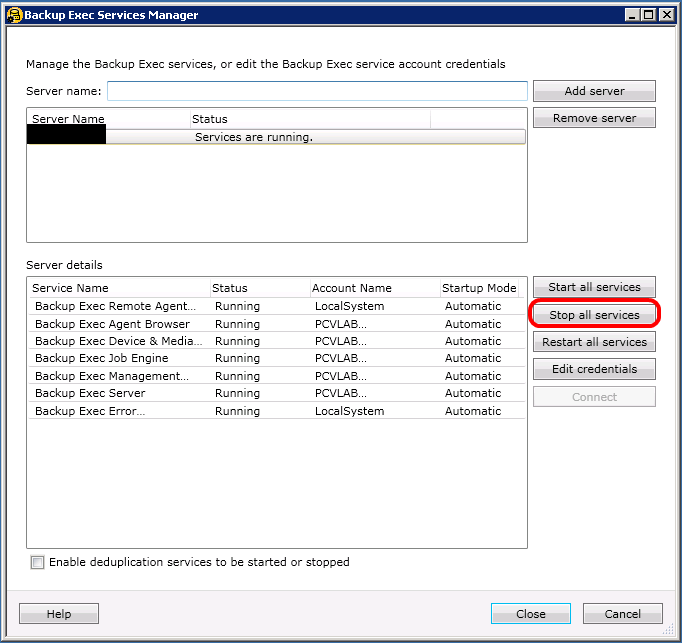 In Backup Exec 2012, you can’t remove the product license from “Install Optoins and Licenses on this Backup Exec Server”, you can however remove the maintenance for any products you have installed. If you want to remove the product license, you will need to do perform a number of steps. Delete the .SLF files from the following location from either of the above file locations, these are the license files for Backup Exec. After you have deleted the files, you must restart the Backup Exec services again. If you have any questions, comments or suggestions, please let me know by leaving a message or hitting me up on twitter. Sometimes you think “This should be pretty simple” and “I know how Backup Exec works, I’ve configured it dozens of times in the past”, but you know what? You’re wrong! Adding a tape library really makes a big difference compared to how you would normally configure a 1 tape drive system. While I’m not going to go into all the configuration details in this blog (that’s something to go through in my technical blog), I’m going to state a couple of things that should maybe make sense but don’t always. Random should be set when you want the software to control the medium changer and Sequential when you want the hardware to manager the changer. Makes sense right? Yeah I though so too. Having it set to sequential will make the medium changer disappear from Windows device manager as well so that’s something to keep in mind (it needs to be in Windows device manager for Backup Exec to see it). 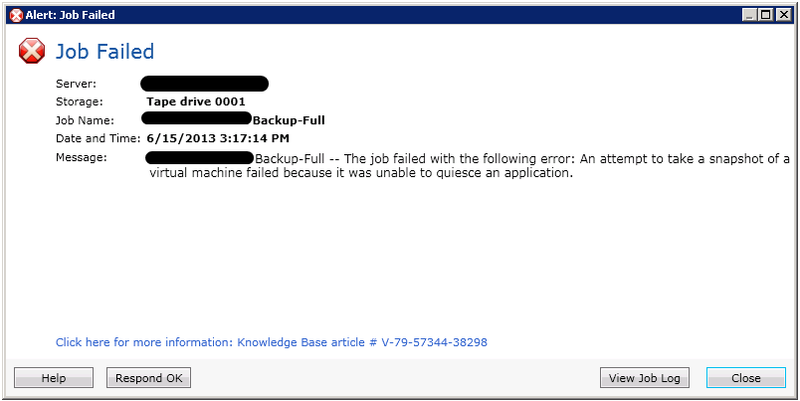 While it may not happen for everyone, I also experienced what happens when you have the Eject tape after completion option ticked in Backup Exec 2010 R3, and that is it causes the library to lock up and needs a reboot to get it back into working order. Great huh? Granted that the device doesn’t have a mechanism for ejecting the tapes out of the library, but seriously. Having a bad tape in the library also caused it to lock up and become unresponsive, so that’s another trip to the server room and a reboot of the library. Now that I have ironed out these errors and I understand how it all works, I can say with %100 confidence that the system is running correctly. I just need to clean out the old media sets and make sure that the correct tapes backup at the correct time. Once all the tapes go through there first run it should all be fine. All in all, throughout all the frustration and stress due to production backups not working properly at least I can say that at least I learnt from the experience I will definitely know for the future. 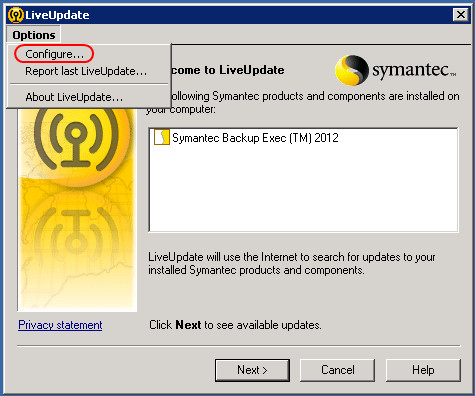 If you suspect that you might have a corrupt update downloaded from Symantec LiveUpdate, or just because you want to clear all update downloads out of your system, you can do this from inside LiveUpdate. 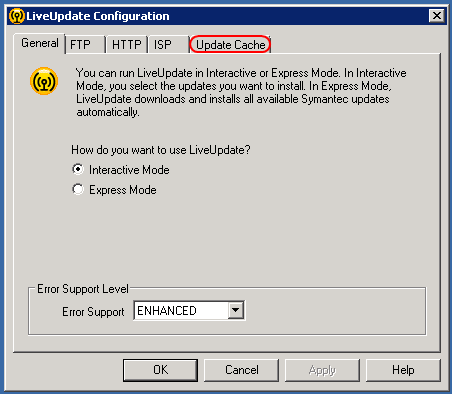 When you first load LiveUpdate, click “options” and then “configure”. 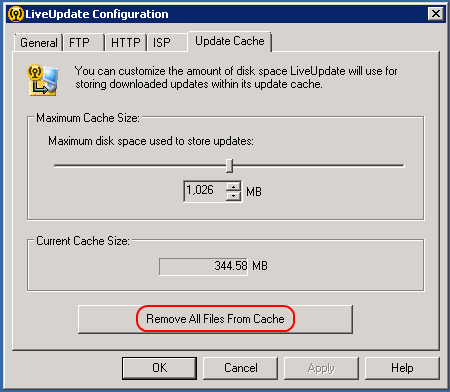 Once completed you will get the following message box indicating that it has successfully deleted files from download cache. 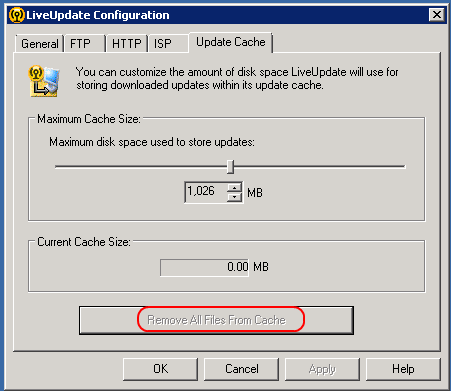 If you have no files to delete in the download cache, the “Remove All Files From Cache” button will be greyed out. Over the weekend one of my backup jobs failed. This job backs up a number of virtual machines in vCenter to tape. What had happened was that while doing a snapshot for one of the servers, it took longer then expected and timed out. The Hotfix you need to make sure that is installed in “Hotfix 199866”. Once this is installed you can go on to make the required registry changes. Next shutdown the Backup Exec services by running the “Backup Exec Services Manager” from “C:\Program Files\Symantec\Backup Exec\ServicesMgr.exe” or whatever your install location is. All keys are DWORD (32-bit), set to Hexadecimal and are case sensitive. Once you have made the registry changes reboot the server for good measure and your done. The increase in attempts and the retry interval should be long enough to fix the timeout problem when Backup Exec is creating snapshots in vCenter. 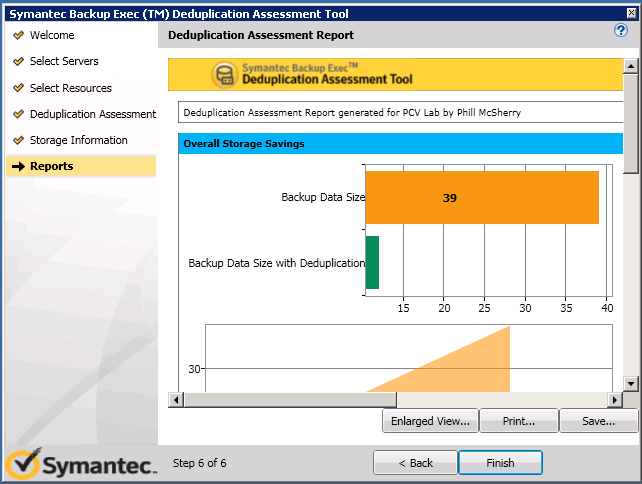 If your a Symantec partner, you have access to the Backup Exec Deduplication Assessment Tool. 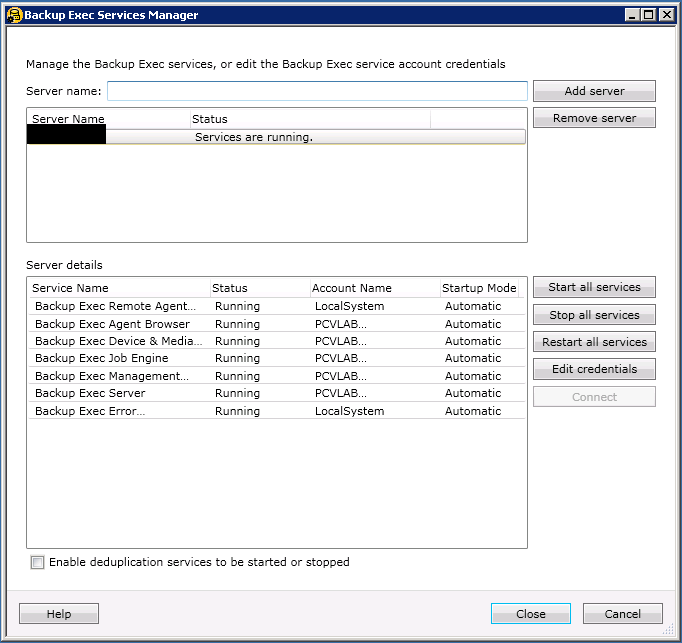 The Backup Exec Deduplication Assessment Tool (BEDAT) can be run to show your customers the benefits of the deduplication option in Backup Exec 2012. 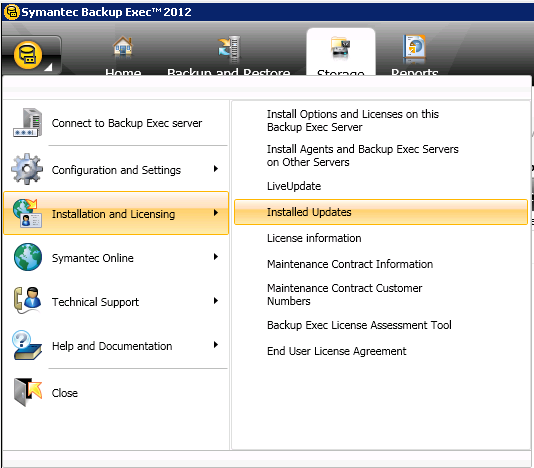 BEDAT is available for partners to download at the Symantec PartnerNet site. 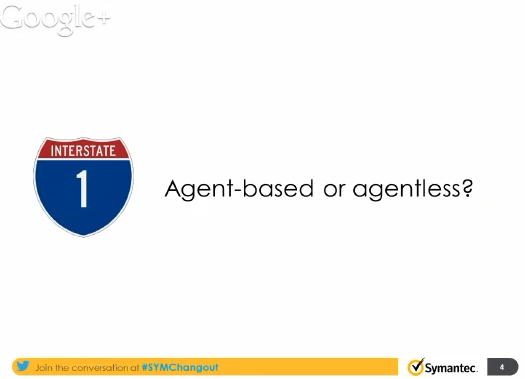 If you are an end user interested in seeing how deduplication can be of benefit to your environment, please contact a local Symantec partner. 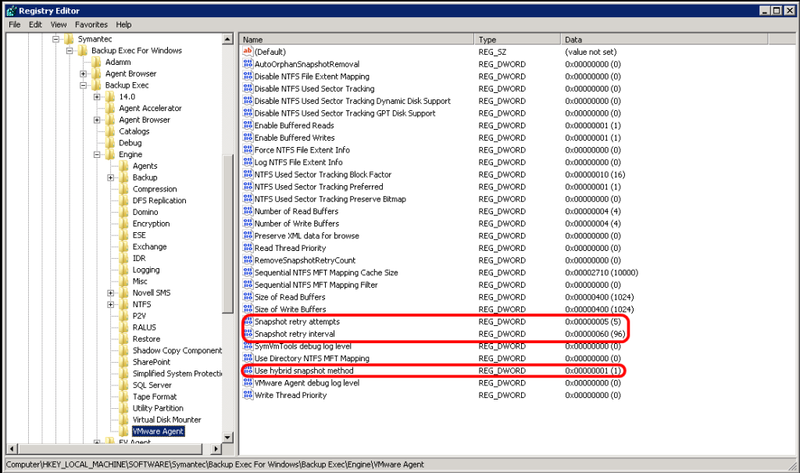 BEDAT is a stand alone executable that will install a temporary deduplication agent to any servers selected in the assessment process. 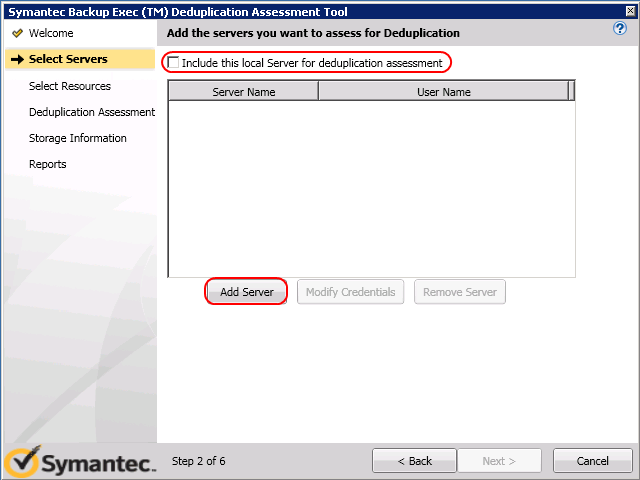 To select servers to include in the deduplication assessment, click on “Add Server”, this will open a Add Server window box. 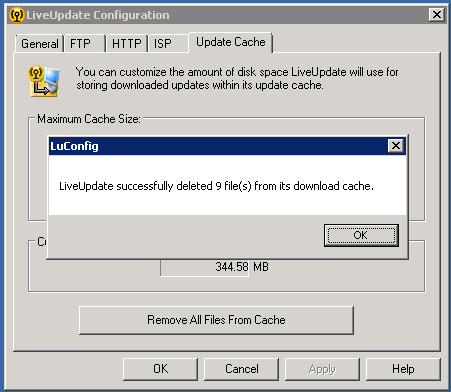 You can also tick the “Include this local Server for deduplication assessment” if you want to include the local server (Obviously). When adding a server, you can either type in the server name or IP address, or browse the network and add your servers that way. 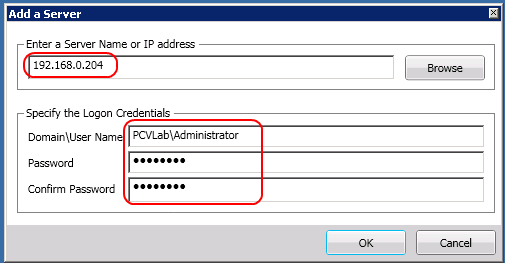 Once you has selected your server, you will need to provide the logon credentials for that server so it can access and install the temporary deduplication agent on this server. When selecting your resources, you can select all resources or specify which drives on which servers you want to analyse. You will also need to make sure that you have at least 1GB of free disk space for every 1TB of data you’re scanning. You can browse or type in a new folder path for the storage of the deduplication temporary data. Depending on how much data you need to analyse, the assessment progress can take anything from several minutes to several hours. Once complete, you can specify the storage information, the backup strategy is either Weekly Full with Daily incremental or Daily Full Backups. The data retention period can be set to weeks, months or years. You can also fill in your partner information, which will be included in the report. 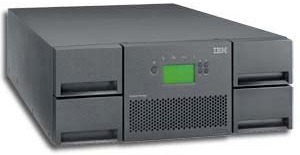 The report is broken down into 4 sections, Overall Storage Savings, Storage Savings by Resources, Storage Savings by Servers and Deduplication Failures by Servers. 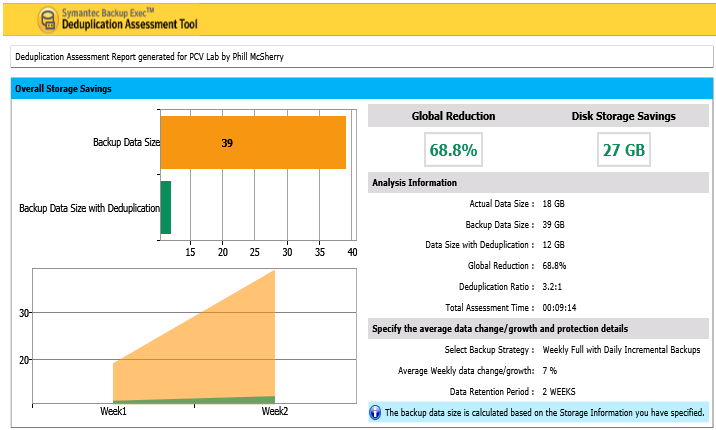 As you can see by the report, this assessment shows that I can save 68.8% or 27GB of savings on storage. 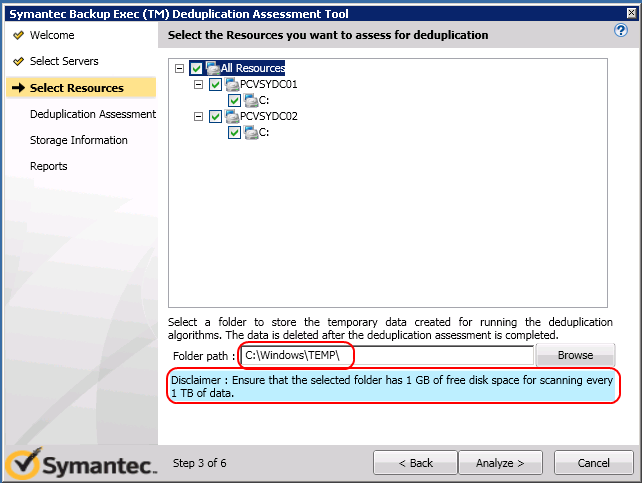 The backup data size can be reduced from 39 GB down to 12 GB with deduplication. 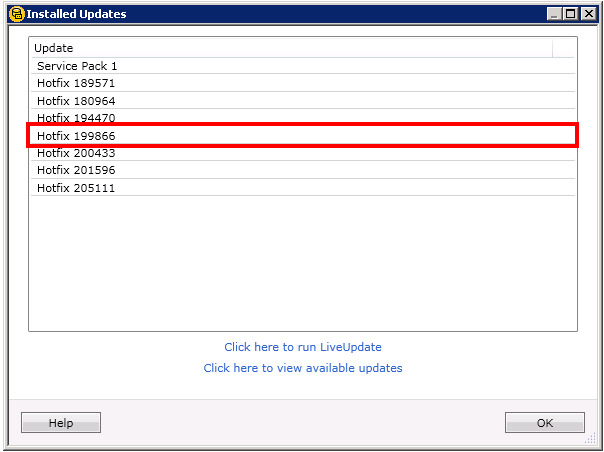 It also shows the deduplication ratio which is 3.2:1 in this case. The next 3 sections shows a more detailed breakdown of the overall savings, including the deduplication rate per server. There is was deduplication failures in this assessment. 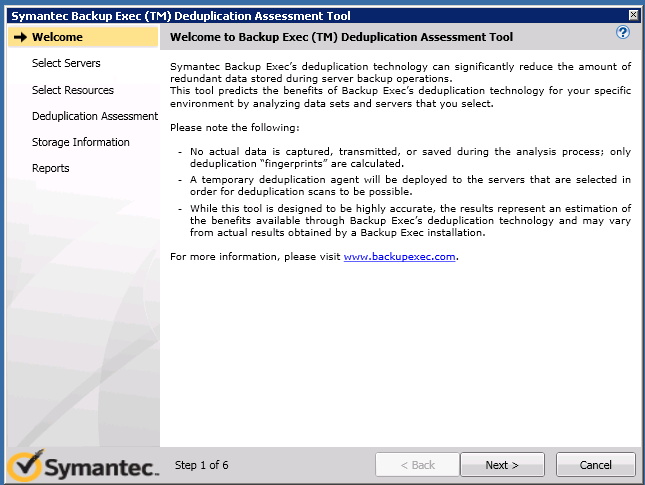 The very last section of the report is a list of the Backup Exec Deduplication Option requirements. 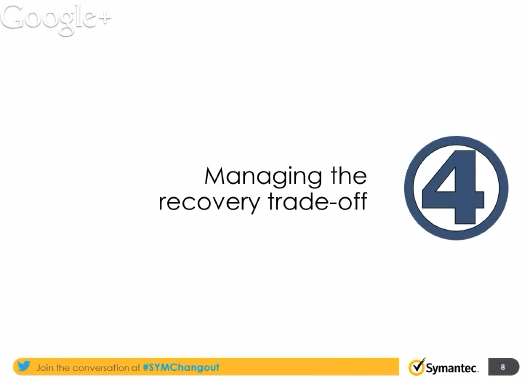 Mays Google+ Hangout by Symantec Backup Exec is on the 5 critical decisions when considering a backup and recovery solution and based on whitepaper by Mahmoud Magdy, Thomas Maurer and Mikko Mykyri. The paper is intended for IT Architects, Backup and Recovery Administrators, and virtualization teams at medium size through Enterprise-scale organizations. You can click on the links to jump to that part of the hangout. 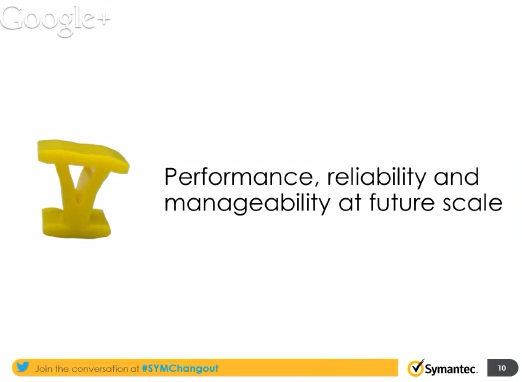 Purpose built virtual domain backup tool or unified data protection? Managing deduplication: Why, where and how?